Curly Strings will perform at the powerful final concert of the JuuriJuhla-RotFest festival in Espoo. The roots of the festival are deep in local traditional music, but the branches are boldly stretching out towards the new worlds of sound. 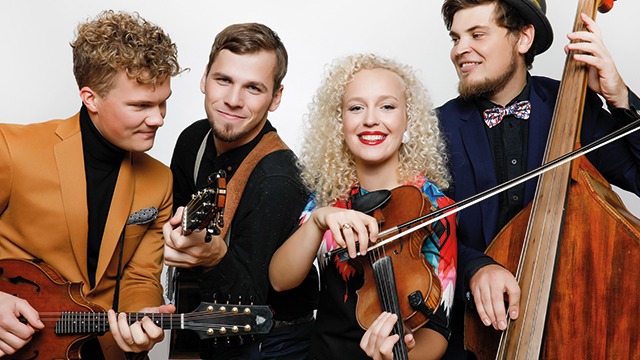 In addition to Espoo and Finnish musicians, international stars such as Curly Strings from Estonia will also perform. Curly Strings will perform at the festival’s final concert on Saturday night at Sellosali and will treat the Finnish audience with “acoustic energy and truly beautiful melodies” (as they are introduced in the program of the festival). The Finnish-Danish-English band Baltic Crossings will also perform at the concert and the music of the club night will be the responsibility of the “wonder women” from the traditional music band ENKEL. The Estonian Institute in Finland supports the performance of Curly Strings.